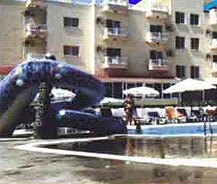 Exotic Hotel started it's service on May 1999 in North Cyprus at Iskele district. This is a family run hotel situated near a small fishing village called Bogaz in the region of Karpaz. This Karpaz region is famous for its historic monuments and structures and many people are being attracted to this land by these structures. Exotic Hotel is a small hotel with 22 rooms, in that 4 suite rooms, 16 standard family rooms and the remaining 2 are of family rooms with shower. All the rooms have facilities like mini bar, TV set with satellite, a hair dryer, and a safe case for keeping valuable things. The rooms also have a sea view which is eye catching and also have a view of mountains which makes the atmosphere pleasant. Exotic Hotel also has restaurants with open buffet system for breakfast. This also facilitates a live music entertainment for visitors from evening and they could enjoy dinner with the same. The Exotic Hotel also has a swimming pool which allows people to have great fun in day times through out the year with various entertainments and bars. The bar around area supplies all kind of drinks and makes guests to enjoy the day with great fun. The hotel also offers great hospitality with care and it is one of the good tourism hotels in that area.